As always, here are your mid month Vancouver real estate stats. The detached market continues to be sluggish, while condo sales, particularly at the entry level are surging (Vancouver studio prices up 24% this year). 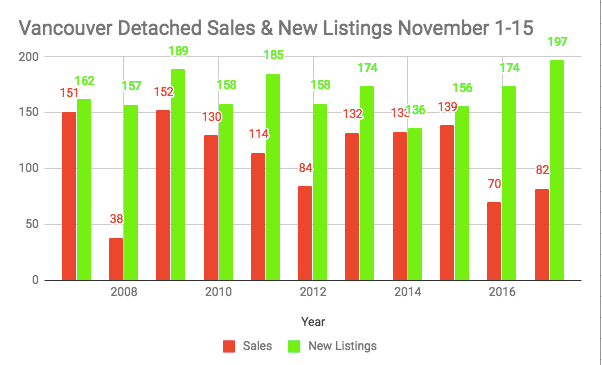 For the first 15 days of November detached sales were up 17% on a year over year basis. Of course this comparing to an abysmal 2016 after the foreign buyers tax. I think the important thing here is new listings continue to grow, and inventory is continuing to pile up after a year of sluggish sales. 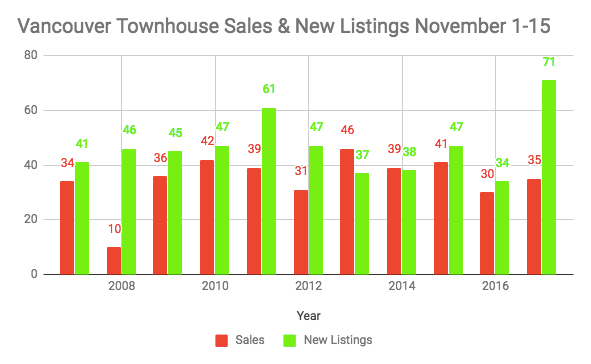 The 197 new listings so far are more than any time in the past decade. Vancouver Detached New Listings hit new high for time period. Nothing different in the condo market. Sales are robust and new listings are thankfully inching up towards more normal levels. New listings for the time period rose 14%. I’ll be keeping an eye on sales to see if we get a surge prior to the January mortgage stress test. 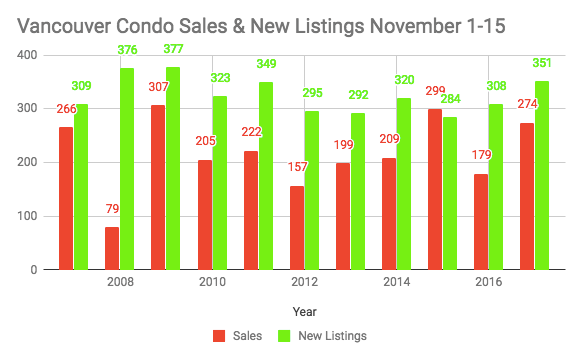 Vancouver New Listings Normalizing in condo market. New supply is beginning to rear it’s head. Vancouver townhouse listings more than doubled from last year and that was almost entirely due to new builds being re-listed on the market as our avalanche of new supply starts trickling onto the market. Sales are at normal/ healthy levels with prices beginning to stabilize. New supply hits the townhouse market.